MANILA, Philippines - Kapuso celebrity couple Dingdong Dantes and Marian Rivera finally tied the knot at the Immaculate Conception Church in Cubao, Quezon City on Tuesday, December 30, 2014. Celebrity friends, fans, and colleagues have shared Dingdong and Marian's big day on social media. 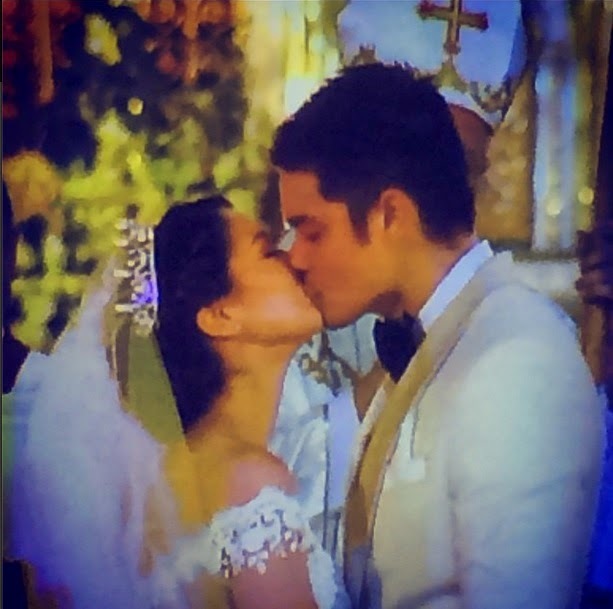 Tuesday Vargas posted on Instagram the first kiss photo of the newly wed GMA Network's Primetime King and Queen. Dingdong, wearing a suit by Randy Ortiz, arrived on a Ducati while Marian came in a newly furnished car his husband fixed up especially for the ceremony. Among the guests are President Benigno Aquino III, sister Kris who stood as a sponsor, Vic Sotto, Gov. Vilma Santos-Recto, Ogie Alcasid and wife Regine Velasquez, Sen. Bam Aquino, Lolit Solis and German Moreno. LOOK: The interior decorations and table setting for #DongYanwedding reception at the MoA Arena.